The Publication Manual of the American Psychological Association, 6th edition, is now available at the library. Consultation copies are located at the Information Desk and in the Reference Collection, and one copy is available for borrowing. Call number: BF76.7 .P83 2010. –EndNote promises a revised APA output style very soon. Visit the blog later for announcements of more APA 6th resources. 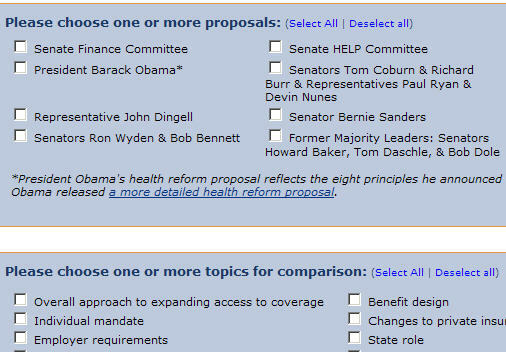 Especially helpful: the side-by-side comparisons of bills currently under consideration in the Senate and House. The Kaiser Family Foundation “is a non-profit, private operating foundation focusing on the major health care issues facing the U.S., as well as the U.S. role in global health policy” and “is not associated with Kaiser Permanente or Kaiser Industries.” Learn more about the Kaiser Foundation. …what’s more, Mark Twain could have demonstrated why with Carnegie Mellon’s Death Risk Rankings. A project coordinated through the Center for the Study and Improvement of Regulation at Carnegie Mellon University, deathriskrankings.org mines European mortality data available from Eurostat and U.S. data available from CDC Wonder. Learn about micromorts, find the risk of death from 66 different causes and create comparative charts. Data can also be exported to Excel. Best of all, if you’re using deathriskrankings.org, you know you’re still alive!